Freshman sprinter, Tyler Sands, recently broke two school records, and is now ranked third in the 200 and ninth in the 100 in the CCAA conference. The CSUSB track and field team’s season may be winding down, but the Coyotes are heating up as the CCAA Championship nears. Track and field joined the lineup of CSUSB sports in 2015. Cross country head coach Tom Burleson led the team for the first three seasons. This season, assistant coach Lauren Reimer was named the new head coach. Burleson remains the cross country coach but now also has the title of track and field assistant coach. For their first meet of the season, the Coyotes traveled to Claremont for the Rossi Relays on the campuses of the Claremont Mckenna, Harvey Mudd, and Scripps colleges. Casie Johnson, who also played for the CSUSB women’s basketball team during the 2016-17 season, participated in four individual events and one relay race. She broke her own record in the 100 hurdles while also competing in the 400 hurdles, the javelin throw, and long jump. Johnson and her fellow relay racers, Aisha Johnwell, Tylin Sands and Kiara Mabien also broke the 4 x 400 record. The Coyotes then traveled to Cal State Fullerton to compete in the Ben Brown Invitational. Johnson recorded a personal best in the shot put, launching the shot over 35 feet. Sands, one of the team’s newcomers, ran in the Division I portion of the event. She placed second in the 100-meter dash. Sands continued to dominate when the team went to Redlands for the Redlands Invite. She ran a 12.30 time in the 100, earning her a top-three spot in the CSUSB record book. Sands also earned the second fastest time for a CSUSB runner in the 200. Johnwell, Mabien, Sands and Janessa Celestine earned the third fastest time in the CSUSB books for the 4 x 100 relay. The 4 x 400 relay team of Johnwell, Sands, Mabien, and Johnson earned a record time that ranks as the fourth best in the CCAA while participating in the Point Loma Invite. Sands broke the school’s record for the 100-meter, while Johnson did the same in the 100 hurdles. 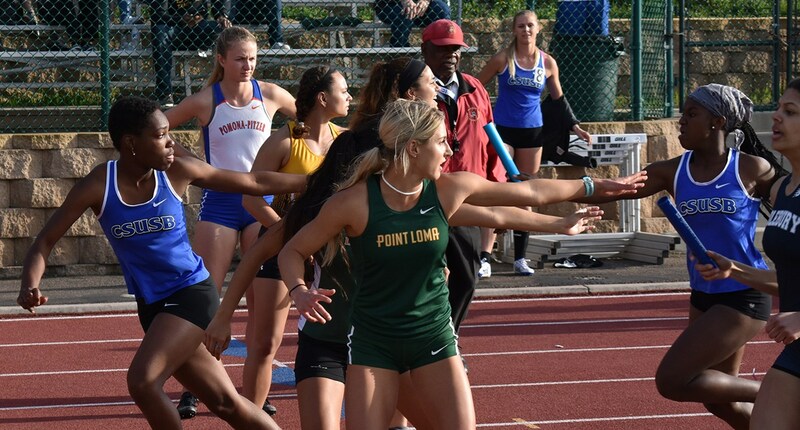 After a trip to La Jolla, where Johnson, Sands, Michelle Pineda Palacios, Joanina Gazcon and Lunden Junious-Reliford (women’s basketball) all reached CCAA Championship standards, the team headed back to Claremont for the Pomona-Pitzer Meet. Several Coyotes met the CCAA standard for their events in Claremont. Those events included discus, 3,000-meter steeplechase, triple jump, high jump, shot put, javelin and the 100 and 200 sprints. For their second to last meet of the regular season, the Coyotes headed to Riverside to compete in the Highlander Challenge. Sands continued to not only outdo herself, but she also surpassed records from previous CSUSB runners in both the 100 and 200. Tehya Burroughs, another member of the CSUSB women’s basketball team, set a school record for the triple jump in her fourth time competing in the event. Johnson reached CCAA qualifying times in the 100 hurdles, 400 hurdles, and the high jump. The Coyotes continue to prepare for the CCAA Championships, which are right around the corner. The championships will take place in Turlock, home to Stanislaus State.